Jared Unzipped: The War On Thanksgiving Has Begun. I visited my local JCPenney retail store in Burlington, North Carolina today. In my possession were a few decent coupons and I wanted to see what clothing I could purchase at a substantial discount. Lo and behold, the horrors I found as walked through their entrance. WHAT IN THE HELL IS GOING ON HERE?! That's right, ladies and gentlemen. JCPenney has already decorated for Christmas by the first week of November. Forget that we just finished Halloween. Forget that we still have THREE FRICKIN' WEEKS until Thanksgiving. Nope... they've just leap-frogged right into Christmas, the most wonderful time of the year! I understand that the holidays are the most profitable retail season of the year. Hell, I'm a retailer myself. But... can we not celebrate each season in its own time? Thanksgiving is my most favorite holiday, yet retailers can't wait to forget about it because it doesn't drive sales. Who wants to buy new suede shoes and cashmere sweaters when they're trying to be thankful for what they already have? Alarmingly, Thanksgiving has become nothing more than a pre-game ritual for Christmas. Folks often have their Christmas Tree and decorations already out for display by Thanksgiving. Thanksgiving has morphed into Christmas Light, just without the exchanging of gifts. Retail stores are no different. They want you to celebrate Christmas early and often. It's all about the War on Thanksgiving... and many of you have blood on your hands. 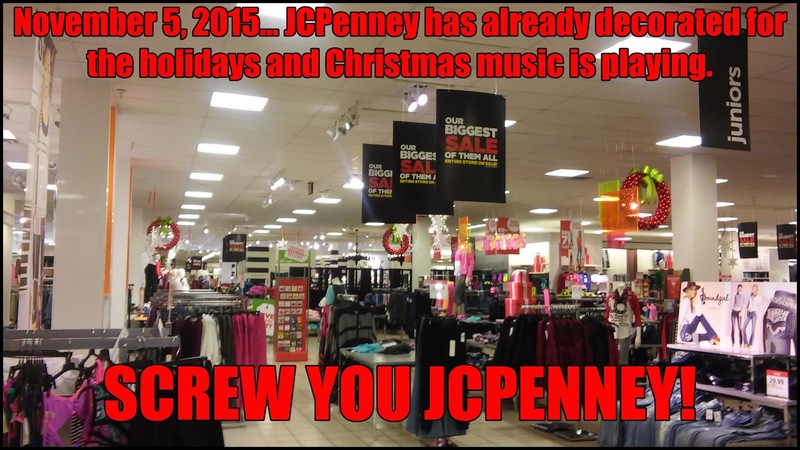 So to JCPenney, I say SCREW YOU. Screw you for cheapening Christmas. Screw you for dismissing Thanksgiving. Screw you for changing the seasons to suit your own selfish whims. I'm sure there are other large retailers that have already set up for Christmas. 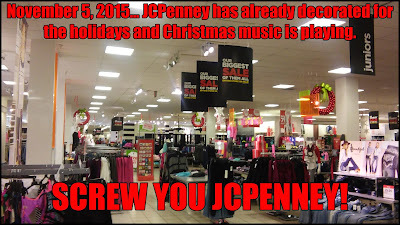 Undoubtedly, JCPenney is probably not the only guilty party. Yet, they're the first example I've encountered... no less than FIVE days into November. Good grief!